Over the past few months, members and regular attendees of Vine Street Baptist Church have purged the closest of old shoes. Why? To provide water in Haiti. Partnering with EDGE Outreach, members and regular attenders of VSBC have come up with several creative ways of getting shoes that aren’t even in their own closets. One member told her Bunco group they couldn’t come to the game unless they had at least one pair of shoes. Another member put up a sign in the lobby of her apartment complex, provided a box and the shoes came pouring in. Here’s some information about what EDGE is doing with the shoes. You can find more information on their website. 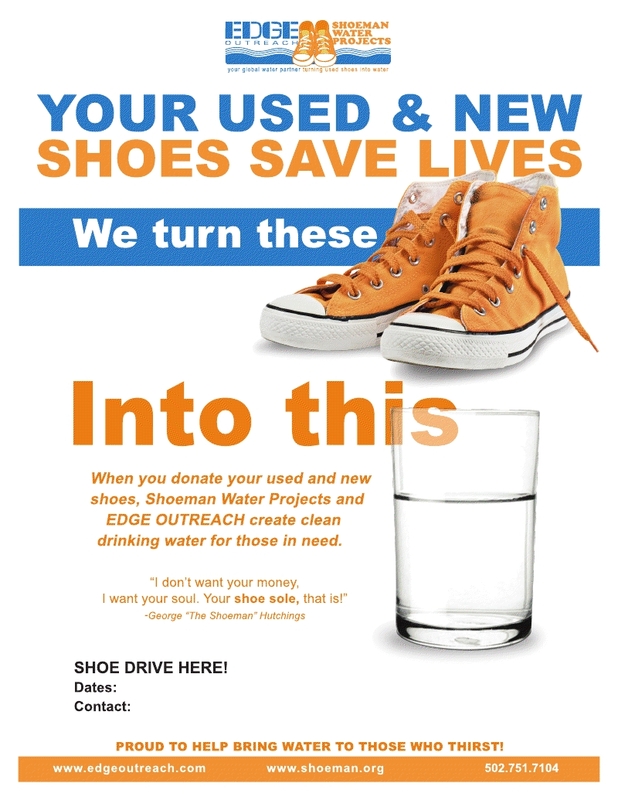 If you have shoes you would like to donate to the project, you can stop by a variety of locations around town. In addition, you are welcome to contact the church at 502.585.3027 or info@vinestreetbaptist.org and workout arrangements for a drop off or pickup. As of this writing, Vine Street Baptist Church has collected 366 pairs of shoes. Way to go folks! Keep up the excellent progress. We’ll post additional updates along the way.